Carpenter's Shelter offers a variety of services and programs for families and children residing in the shelter. No child deserves to be homeless. Every action we take at Carpenter’s Shelter is aimed at strengthening homeless families to live successfully in the community, out of poverty, and as productive community members. While living in the shelter, we encourage our youngest residents to continue being a kid! 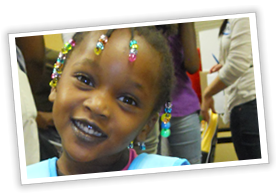 From 8:30 a.m.-3:30 p.m. all children attend school or daycare, and many of our children attend after-school care. Each night, volunteers facilitate children’s activities while their parents attend various programs like parenting and financial literacy classes. Statistically, homeless children are more likely to be affected by obesity and learning disabilities than those living in a stable household. Upon entering the shelter, each child is assessed by Case Managers for their individual needs. Carpenter’s Shelter works diligently to ensure every child is given the opportunity to succeed regardless of their housing situation.